Casio is showing off the latest addition to its Exilim Pro-range at this year's CES. 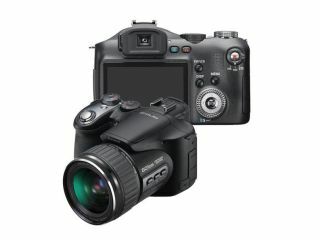 The Casio Exilim Pro EX-F1 is said to be amazingly fast, offering 60fps photo shooting and 1,200fps video recording. Casio says it's capable of taking many more pictures per second than any previous consumer camera model, making it the fastest Digital SLR in the world. The Exilim Pro EX-F1 features a 6-megapixel sensor, 12x optical zoom and manages to take 60 still photos per second. There's also a Pre-shot burst mode that starts shooting images before you've even pressed the shutter button down all the way - you can take 20 photos before fully pressing the button, and 40 afterwards. The buffer memory only holds 60 photos however, so any previous shots will be deleted if you press the shutter button for an entire second. The Casio Exilim Pro EX-F1, first announced at IFA in September, can also shoot amazingly fast video. Shooting at normal speed gives you Full HD recordings at 1080p resolution, but if you want faster speeds the resolution is reduced. Shooting at 300fps, for example, means you'll get 512 x 384 pixel footage; maximum resolution in the 1,200fps mode is 336 x 96 pixels. At such speeds, says Casio, it's possible to capture the finest details of sports action, such as the way the surface of a tennis ball is compressed when it impacts a racket. The Casio Exilim Pro EX-F1 is expected to go on sale in March, priced at a cool $1,000 (£510).